1861 Employing 97 men and 48 boys. 1896 Advertised a steam powered "horse-less carriage". 1897 April. Details of a steam carriage built with T. Toward and Co.
1916 Sale of business. Atkinson and Philipson, Coach Works, Pilgrim Street who are retiring from business. 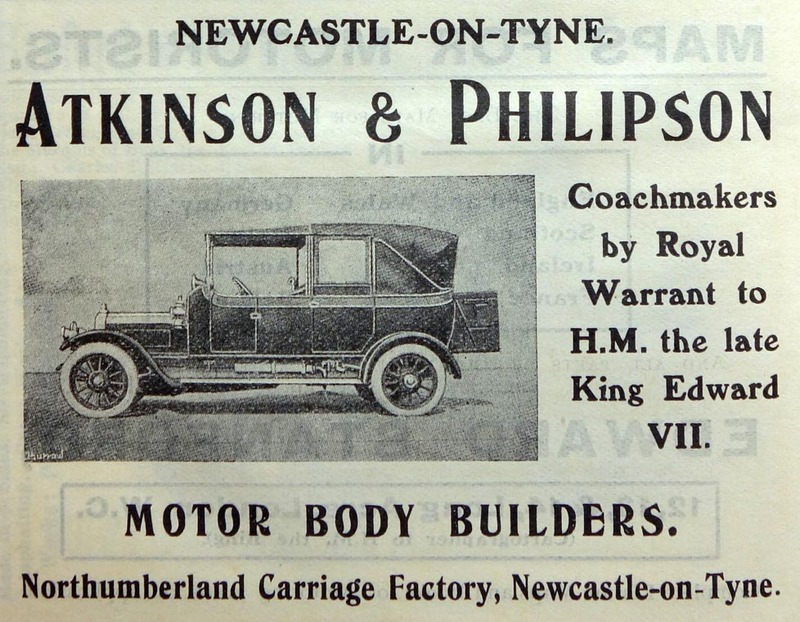 ON the last Saturday in February there was a semi-private assembly at the carriage-building factory of Messrs. Atkinson and Philipson, Newcastle, to inspect a new motor-carriage, locally invented, designed, and built, and, as to parts, patented and registered. The new autocar is the joint production of two well-known Tyneside firms — Messrs. Toward and Co, engineers, St. Lawrence, and Messrs. Atkinson and Philipson, the eminent Newcastle carriage manufacturers. The latter firm have supplied the carriage and wheels and the former the motor. The joint production is a smart wagonette, well designed, and of compact appearance, while the motor is apparently equally satisfactory, and in actual trial in the yard gave promise of performing efficiently on the road. As the first product of its designers and builders, however, it was interesting mainly as giving a concrete illustration of the ideas which will probably prevail for some years in regard to the new mechanical road locomotion. In the north of England there have not been many motorcars seen in public, at all, and the majority of those that Northumbrians have had an opportunity of seeing in public have not been such as to inspire much confidence or hope for the future of motor traffic; they have been chiefly gasoline-motors of French or American pattern and manufacture, and have been unpleasantly odoriferous. 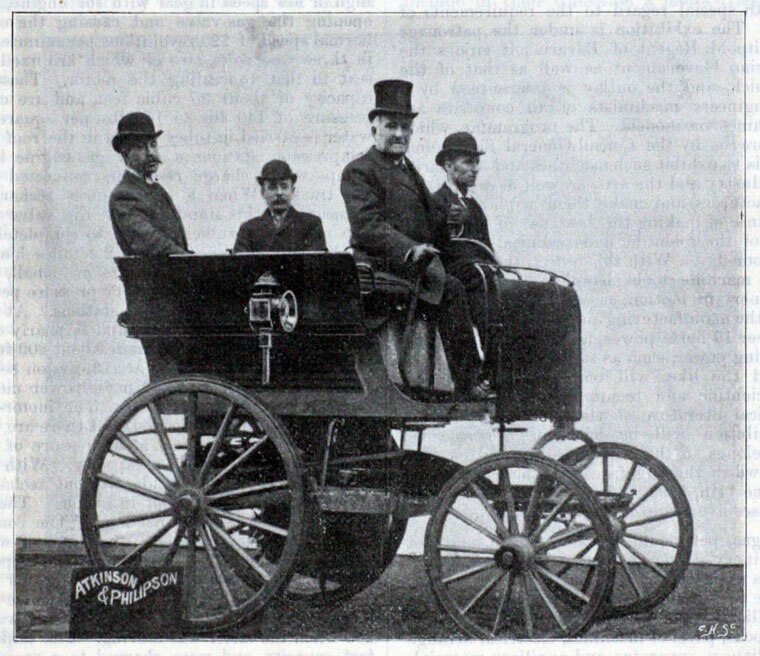 For the purposes of French autocar competitions, oil seems to have bean a greater favourite than steam as a motive power, electricity not yet being a practical competitor; but in England the gasoline-motors have not found so great favour as steam is likely to receive when the numerous inventors who busy with steam road-carriages show what are the capabilities of the older power. Messrs. Toward and Co. — there are three partners who have interested themselves in the design of the motor exhibited, and one of them, Mr. Meek, is a fairly old hand at the game, for he made for himself 20 years ago a very workable steam tricycle — and Messrs. Atkinson and Philipson have designed a very strong and neat frame for their autocar, all the parts of which are admirably fitted for their purpose. Instead of taking a normal carriage or trap and storing the motor somewhere about it, they have taken the motor and built the carriage around it. 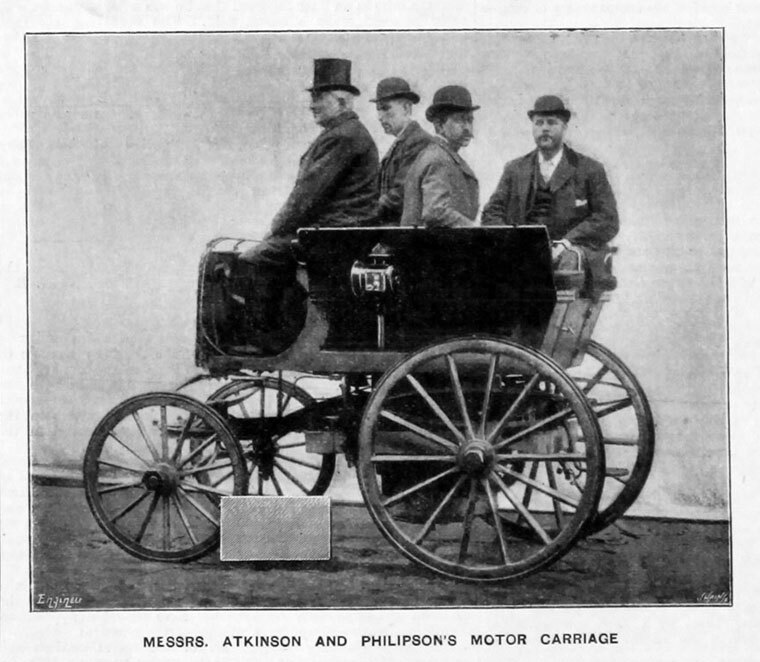 Mr. John Philipson, and his two sons, Mr. William and Mr. John Philipson, are adepts in their art, and, while not abandoning the old principles of carriage construction, they have designed a special framework which admirably supports the motor, while at the same time carrying passengers somewhat after the style of a four-wheeled dog-cart or wagonette. As to the motor, no one who saw it at work could doubt for a moment the immense preference it must possess, other things being equal, over any kind of oil motor. Smoothness of motion, absence of vibration and smell, and simplicity of handling were at once evident. Probably something else than the rubber-tyred wheels will he required to save the motor itself from the effects of the shock and concussion of rough roads, and perhaps in future carriages a similar arrangement of springs to that which protects the body of the carriage will be fitted to the motor. In the carriage now made the fuel used is coke, but the intention is to employ petroleum. The boiler is of the water-tube type, and superheated steam is obtained somewhat after the same style as in the Serpollet generator, thus dispensing with ordinary boiler fittings, such as water gauges, valves, air gauges, thermometers, &c. Before starting the furnace is lighted, and the boiler tubes — which, however, are not flattened, as in the case of the Serpollet generator — arranged spirally reach a red heat. A hand pump is employed to force into the boiler just sufficient water to supply the requisite amount of steam — which is instantly generated — and, when once a start is made, the water is pumped automatically in fixed quantities into the generator. From the time of lighting the furnace steam can be got up in about 20 minutes. Once the furnace is going, however, a few seconds pumping suffices to start the engine. The engine is of the compound type — the two cylinders being placed on each side of the boiler between it and the hind wheels — and drives a shaft from which the power is communicated to the axle of the rear wheels by a roller chain of bicycle pattern. Here a very ingenious differential gear is fitted. The engine is three horse-power, and the weight of the whole carriage, motor included, is considerably under 10 cwt., so that it does not err on the side of excessive weight. The engine works at a pressure of about 140 lbs., and a speed of 12 or 13 miles an hour, it is estimated, can easily be maintained. The driver has few complications to attend to; once a start is made, the machinery runs automatically, with none of the multitudinous handles and levers to be turned that are found on some motor-carriages. The one lever for tuning on steam regulates the speed of the carriage to a nicety, and the steering handle acting on the fore-carriage and the foot-brake (which it is intended to supplement by a screw brake) acting on both driving wheels are the only things to claim his attention. A very clever arrangement permits of stoking from the top of the boiler case, without losing heat; in fact, all this details have been thought- out with great ingenuity. The trial was only an initial one, but it showed enough to demonstrate that Newcastle has at last what promises to be a very efficient autocar, serviceable for both town and country use, for rough roads and smooth, for hilly districts as well as level. It would serve for purposes of pleasure as well as for commercial uses, and, what is of the greatest importance, is not apt to get out of order, while it is simplicity itself to manage. The inventors and makers are to be congratulated upon having been the pioneers on Tyneside in the manufacture of autocars, and upon having at their first attempt turned out so satisfactory a machine. It needs improvements in details, but we feel sure that it is all right in the main. This page was last edited on 17 March 2018, at 00:24.